Back row: W.H. Truscott (V.P. ), W. Bushell (V.P.) ; second back row : C.E. Beyer (Patron), H. Pazzi, H. Howard, Brian Godbold, W. Allen, W. Lake, Tom Watson (V.P.) ; Sitting : S.J. Roberts (Vice Captain), Bob Anderson, Ben Anderson (Captain), Chaz. G. Lord (Coach), Bob Grant ; on floor : Eddie Jackson, H.D. Anderson (Mascot), J.S. Anderson, Gordon Grant. Plattsburg Public School, 1934. A nursery of talent. Australia footballer Reg Date is on the extreme left in the front row. Photograph: Dr Philip Mosely by courtesy of Thomas Lovett. Three match tour Australia won all three. Scoring 21 goals,Conceding only 2. 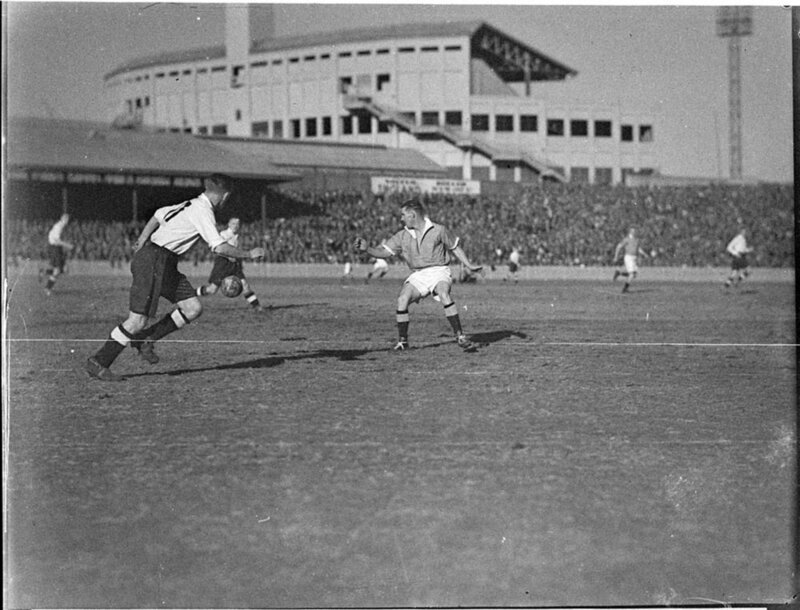 Goalmouth scramble in the game between New South Wales and the touring England amateur team, Sydney Showgrounds, 3 July 1937. England won 3-1. 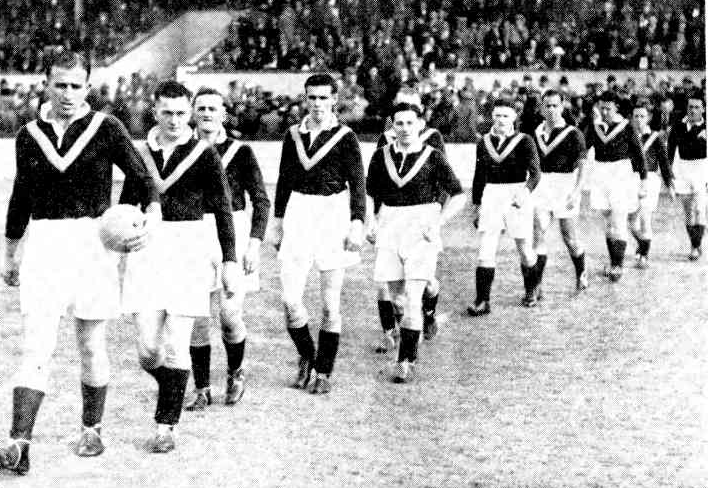 Players from left to right: J. Williams, E. Wilson, W. Stirling, A. Edwards, R. Skellern, R. Erskine, J. Kenny, J. Greenhill, C. McEwan, J. Henderson, A. Wilson. An England "amateur" side toured Australia after a six year negotiating period to get them here. 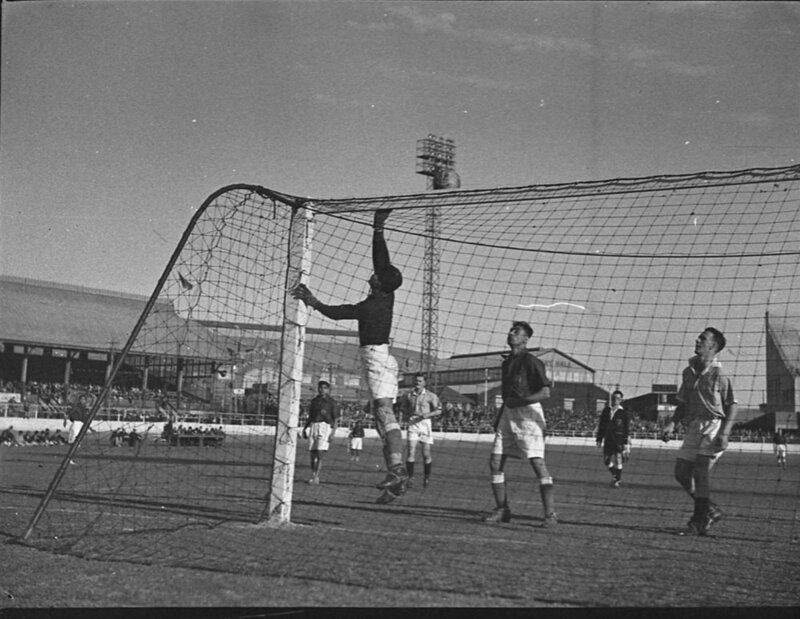 The 'A' was thought impossible to bring to Australia so an English Amateur Team toured in their place. 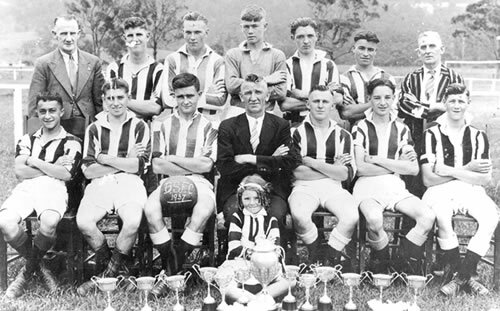 There is some conjecture as to whether these matches were A or B internationals but since the English FA don't recognise it as internationals they are classed as B.
Wollongong Soccer Club: Winners Langridge Physical Culture Cup, Season 1932. At a match against the New South Wales Protestant Churches Association. Back row- D. Johnson (Referee), S. Purnell, T. Johnson,R. Jones, J. Maxwell (President), M. Richardson, W. Smith (Secretary), G. Dale, T. Purnell, A. Parsons. Front row- J. Bell (Captain), G. Williams, K. Wall, D. Warren. The team colours were blue and gold.